Ilya Bolotowsky was born in St. Petersburg, Russia on July 1, 1907. His father was a lawyer in Russia and continued to practice law in the United States until he died in 1957. His mother studied natural sciences but became a self-taught painter. Bolotowsky was home-schooled by a private tutor starting at a fairly early age which helped spark his interest in the arts, allowing him to practice painting and drawing. However, after the Russian Revolution, Bolotowsky and his family fled to Istanbul, where Bolotowsky attended the College of St. Joseph from 1921 until 1923. In 1923 they immigrated to the United States, settling in New York. Bolotowsky soon enrolled at the National Academy of Design in New York City, attending school from 1923 until 1930 with Ivan Olinsky (1878-1962). During the 1930s, Bolotowsky became associated with a group called "The Ten," which included artists Mark Rothko (1903-1970) and Adolph Gottlieb (1903-1974), who rebelled against the strictures of the Academy and held independent exhibitions and explored the use of abstraction for expressive purposes. Bolotowsky explored unusual and abstract art as a young artist, interested in unconventional styles for his time. He began to work as an art teacher and textile designer to afford his interest in painting. In 1930, Bolotowsky had his first independent show at New York's G.R.D. studios. He soon received a small scholarship which funded his excursion to Europe. In 1932, Bolotowsky traveled throughout Europe for ten months, making brief stops in Italy, Germany, Denmark, England, and Paris. Returning to the United States, Bolotowsky experimented with several different styles, such as constructivism and biomorphic abstraction, focusing on the work of artists like Chaim Soutine (1893-1943) and the work of expressionists. Upon his return from Europe in 1933, Bolotowsky went on an artist retreat to the artist's colony Yaddo in Saratoga Springs, New York. After Yaddo, Bolotowsky returned to New York City and toyed with several stylistic approaches, deeply influenced by two artists he experienced while abroad: Spanish artist Joan Miró (1893-1983) and Dutch artist Piet Mondrian (1872-1944). Bolotowsky adopted Mondrian's use of horizontal and vertical geometric pattern and a palette restricted to primary and neutral colors. In 1936 he painted one of the first abstract murals of the Works Progress Administration, the Williamsburg Housing Project in Brooklyn, New York. This program aimed to provide work for artists during the Depression and this mural was one of the first abstract murals to be completed under the Federal Art Project. Although Bolotowsky demonstrated clear control of his images, he was less concerned with the method of creation when determining his subject and focused on the importance of how the painting would impact the viewer. In the same year, Bolotowsky acted as one of the founders of the American Abstract Artists Group, an organization of painters who were dedicated to abstraction with the purpose to increase the acceptance and understanding of the style. These artists worked within several abstract styles, including cubism, neo-plasticism and biomorphic expressionism. He also co-founded the Federation of Modern Painters and Sculptors. Also during the 1930s, Bolotowsky was married for several years to artist Esphyr Slobodkina (1908-2002). She was a versatile painter, sculptor, and illustrator, most widely known for the children's books that she illustrated and sometimes wrote. Her art displayed elements of cubism, constructivism, and abstract surrealism in clever and vigorous works, very similar to the early work of Bolotowsky. During the 1940s, Bolotowsky developed his art within the neo-plastic style, completely eliminating his art of biomorphic elements and working solely with horizontal and vertical divisions. During this time, he also experimented with the shape of the canvas, well-known for the diamond, oval and rectangle. After completing the Williamsburg Housing Project in 1939, he began to work on his next project, the New York World's Fair mural. This mural was located in the Hall of Medical Science, where Louis Scanker (1903-1981) also had a mural. These murals had a combination of biomorphic and geometric shapes. In 1941, he completed another federal arts project in the Hospital of Chronic Disease on Welfare Island. It was the largest abstract mural in the hospital measuring nine or ten feet high by fifty feet. Around the completion of this mural, World War II was getting bad and Bolotowsky took a test to become a technical translator of Russian for the War Department. Without preliminary training, he became a technical translator and began writing a military dictionary. Bolotowsky was then sent to do liaison work in languages at Nome, Alaska, with the Soviet Air Force. After serving in World War II, Bolotowsky returned to his family's apartment in New York City and began painting again, beginning exactly where he left off like there was no time lapse. He met J.B. Neumann, who became a dealer for the Peggy Guggenheim Gallery and set up Bolotowsky's first real one-man show in 1946 at the New Art Circle. Continuing in the same year, Bolotowsky soon began teaching, starting with a two year appointment at the Black Mountain College from 1946 until 1948. After, Bolotowsky moved to the University of Wyoming, teaching as an associate professor of art until 1957. While in Wyoming he started making experimental films, receiving a grant for filming from the graduate school. Starting in the 1950s until around 1970, Bolotowsky produced many films, winning first prize for Metanoia at the Midwest Film Festival at the University of Chicago in 1963. Although Bolotowsky produced various films, he still taught at numerous locations throughout the United States. From 1957 to 1965, Bolotowsky was a professor of art at State Teachers' College in New Paltz, New York and then from 1965 to 1971 he taught at the University of Wisconsin in Whitewater. Although committed to his long-term teaching jobs, Bolotowsky was also had short-term and adjunct positions at Brooklyn College (1954-56), Hunter College (1963-64), University of New Mexico (1969), and Queen's College (1973); officially retiring from teaching in 1976. He returned to New York City and died at the age of 74 in 1981. While growing up in Russia, Bolotowsky was able to develop his interest in art through private teaching and tutoring, either from his professional tutor or his mother (a self-taught artist). However, he soon received an education in Istanbul and New York City. His beginning paintings were created through a combination of biomorphic and geometric shapes on the flat picture plane. Consisting of timid arrangements of small rectangles on rectangular and diamond-shaped grounds with muted, mixed colors he employed by combining melancholy minor colors, as well as painting with primary colors. His beginning paintings are typical of many sober, unresolved, but serviceable cubist compositions, based on synthetic cubism and Russian constructivism and suprematism. An example of this early style is Abstraction (1934), an oil on canvas, depicting a combination of biomorphic and geometric shapes in contrasting colors. Bolotowsky's style was soon influenced by Piet Mondrian and Joan Miró and their abstract art. Bolotowsky first saw Piet Mondrian's paintings in 1933 at the Gallatin Collection at New York University. Mondrian's art fell under the De Stijl style of modernism, a form of nonobjective art that emphasized the need for abstraction and simplification and for clarity, certainty, and order. After this first confrontation with the style of De Stijl, Bolotowsky's art evolved from his earlier figurative and semi-abstraction to an even more abstract style that he called neo-plasticism. Over time, Bolotowsky discarded all illusion of space and banished biomorphic forms from his paintings, developing his own style from the true neo-plasticism discipline. He limited the right angle relationships between forms and decided to banish the diagonal because it disturbed the balanced spatial tension and harmony he was aiming to achieve. Bolotowsky explains, "I work in the neo-plastic style because for me it is the most meaningful and exciting direction of art. As a neo-plasticist, I strive after an ideal of harmony; neoplasticism can achieve unequaled tension, equilibrium, and harmony through the relationship of the vertical and horizontal elements." (Utah Museum of Fine Arts). Mondrian's clear style aided Bolotowsky in achieving balance throughout his paintings by using right angles, eliminating the diagonal, and creating a sense of order (American Art at the Phillips Collection). However, unlike Mondrian, Bolotowsky did not restrict himself to the traditional style of De Stijl, expanding his palette and not restricting it to the primary colors of yellow, red and blue (although he did generally use these colors in the larger areas of his canvas). Bolotowsky preferred to emphasize a variety of colors that were muted, earthy, unorthodox in variety and totally un-European in feeling. Starting around 1947, he also experienced with shaped canvases, starting with a diamond-shape, followed by ovals, tondos (round), ellipse, and odd rectangles. These complicated shapes display the high degree of control Bolotowsky had in his later work. Continuing to change in style, Bolotowsky was influenced by the Abstract Expressionist movement in the 1950s. His colors became tuned up and saturated and his shapes became larger and fewer. His paintings stand out with moreclashes in colors and resolutions of bright rectangular shapes. 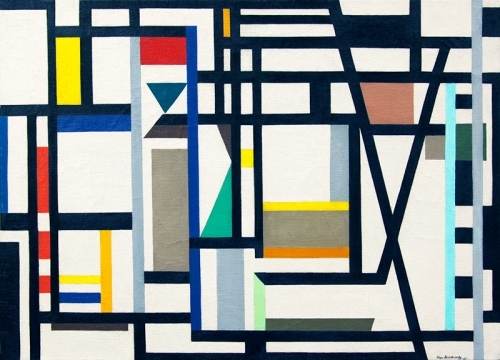 Bolotowsky's sophisticated geometric abstractions were based on a balance between linear spatial divisions and striking color tonalities. His paintings are said to have a "particular aliveness that distinguishes art from decoration" (Herrera). An example of these later images is Large Cobalt Diamond (1957). It has fewer and larger colors and shapes, and the edge of the canvas balances the linear movements of the image. In 1961, Bolotowsky began applying his favored primary colors to column-like three dimensional forms. The painted imagery on the surface of these columns and sculpture reflect his paintings. These three-dimensional sculptures allowed Bolotowsky to create an "ideal, balanced harmony" through the interaction of building blocks: line, color, and plane (Biographical Resource Center). His paintings within the 1970s use primary colors mixed with black and white, emphasizing the vivid contrasts between colors. He uses geometric shapes that are more rigid with straight edges, becoming more like decorative art (Raynor). In addition to painting, Bolotowsky created films and plays. He expressed various kinds of subjective and emotional issue within them, which he consciously eliminated from his neo-plastic pictorial images.